Mortons Neuroma (also referred to as Mortons Neurofibroma, Mortons Metatarsalgia, and Mortons toe) is a relatively common cause of Metatarsalgia (pain under the Metatarsal area). The term Metatarsalgia (meaning: pain in metatarsal area) is often given as a ‘diagnosis’ to patients who exhibit pain around the heads of the Metatarsal bones (knuckles) and is not a precise diagnosis of any condition. Considering there can be several different causes of pain in this area (of which Mortons is only one cause) the term ‘Metatarsalgia’ therefore does not offer patients a precise diagnosis and is not helpful. It is used mainly as a general term by practitioners where the precise cause of pain in the metatarsal area has not been established and is of little diagnostic value. Despite Mortons being perhaps the most common cause of deep pain in and around the Metatarsal & MTPj (Metatarsal/Phalangeal joints)areas it is often a condition that is not identified and/or, is misdiagnosed by the majority of GP’s and many Podiatrists/Chiropodists. This is partly due to the variation of the symptoms it can present with. Typically a patient will complain of vague pains around the forefoot area particularly when tight, thin soled shoes have been worn (especially with a heel), or the patient has walked barefoot on a hard floor surface. 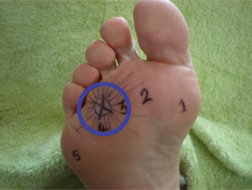 Pain can occur on the top and/or underneath the foot focussed around the area between the MTPj’s. 80% – 90% of cases occur between the 3rd & 4th MTPj’s (see pics below). The pain is triggered by weight bearing activity and relief of symptoms is achieved by removing the shoe, resting the foot and/or massaging the affected area. The pain can be sharp and localised and/or it can be duller with referred pain extending over whole of the forefoot and occasionally even further. The diagnosis is more obvious when the patient complains of a “sharp shooting pain going into my toes” (especially the 3rd & 4th) and sometimes a “pins and needles feeling in my toe cleft” (directly after the shooting pain has occurred). With these classic symptoms listed above even an inexperienced practitioner should suspect a Mortons, however with the majority of cases we do not have the luxury of such obvious symptoms being present. Therefore with many patients a diagnosis is only achieved by a Practitioner with familiarity and experience of Mortons, relying on clinical instinct, and the elimination of other possibilities. One test that can be decisive in diagnosing the presence of a Mortons is for the practitioner to test for a click (Mulder click). Here the foot is squeezed horizontally whilst the MTPj’s are pushed upwards & downwards repeatedly. If a ‘squelching’ click is felt by the Practitioner (particularly if this is accompanied by pain), then a confident diagnosis of a Mortons can be given. Alas not all Mortons will provide positive Mulder clicks. A Mortons Neuroma is effectively a fibrous thickening on a metatarsal nerve that has occurred following repeated ‘squeezing’ by the adjacent MTPj’s (knuckles). The more the nerve is compressed by the adjacent MTPj’s the larger the Neuroma becomes. As the Neuroma increases in size the easier it becomes to produce pain. To see a Mortons would be like looking at a small knot on a piece of dental floss. Unfortunately Mortons neuromas do not disappear with the passage of time. Once a fibrous thickening has developed on the metatarsal nerve then it is there to stay. The more the patient ignores the symptoms and continues to wear shoes that aggravate the problem the worse the problem becomes. For this reason it is essential that patients receive an early diagnosis and are given the appropriate advice before the condition starts to affect their mobility significantly. In mild to moderate cases we would advise patients to avoid any form of footwear that aggravates the problem in favour of generous fitting laced shoes with a thick soft sole, i.e. running trainers or the nearest thing to them that the patient would find acceptable to wear. Flip-flops, crocs, or similar are also recommended. Additionally we may consider modifying the inlay in your shoes if appropriate. If the shoes are a generous fit then we can add a small dome shaped attachment to the underside of the inlay that sits just before (not directly under) the affected MTPj’s. This will have the affect of forcing the MTPj’s upwards and apart slightly when weight bearing, thus reducing the pressure exerted on the nerve by the adjacent MTPj’s. Over 50% of patients who wear the modified inlay will report an improvement in the severity of the symptoms. We would also consider injecting a cortico-steroid solution into the affected area as this can also prove to be very effective. For well established cases of Mortons we would advise the same treatment regime as above, and if we were confident that the patient had been compliant with regard to avoiding inappropriate footwear, and the symptoms continued to affect mobility during certain activities, then we would also recommend referring the patient to a Podiatric Surgeon for surgery. Surgery would involve making an incision on top of the foot (forcing the soft tissues apart to expose the metatarsal nerve and the neuroma on it. The nerve is then severed just before the neuroma. This procedure is relatively simple to undertake and has a high rate of cure although a small percentage of patients may experience neurtitis (nerve pain) for a long time afterwards (in rare cases this can be permanent). The top of the foot would be swollen for a few weeks post-operatively and patients would require at least two weeks off work, and be expected to avoid any unnecessary weight bearing activity over that time. The corresponding toe cleft that the severed nerve provided sensation to would be permanently numb, although this would not be a major issue and certainly should not preclude patients from considering surgery where appropriate. Some Orthopaedic Surgeons will incise from the sole of the foot to gain access to the Neuroma (as apposed to Podiatric Surgeons who almost always incise from the top of the foot). Incising the skin on the sole of the foot often leaves the patient with permanently painful callus and scar formation. Our advise to patients who require surgery for Mortons Neuroma is to ensure that the Surgeon who undertakes the procedure will gain access to the Neuroma from the top of the foot and NOT the sole. For very well established cases of Mortons where all other measures have proved ineffective and mobility is affected significantly, then there is really no alternative to surgery. Some Podiatric Surgeons have experimented with injecting alcohol into the affected area (in an attempt to ‘chemically degrade’ the neuroma) as an alternative to surgery and have reported favourable outcomes. However there needs to be more research undertaken and published before we would be willing to pass judgement on the technique. As a practice we would be more than willing to provide details to patients who are keen to pursue this option. However the majority of patients with Mortons do not require surgery and through avoiding footwear that aggravates the problem can remain relatively unaffected as is the case with the senior partner in our Practice. . .Mark Hollinshead. Since Mark is a Podiatrist he was able to identify the symptoms from a relatively early stage and act upon it thus preventing the problem from becoming significantly worse. Obviously this is not the case for most patients and therefore we would urge anyone who can relate to the symptoms previously discussed to contact our Practice for a consultation appointment. Remember that if you do have a Mortons and ignore it there is every possibility that it will just get worse.